Alike most of the Bengalis I am not a Dhokar Dalna fan but I make it often since Hubby loves it a lot! Dhokar Dalna is a signature vegan Bengali dish where Dhoka depicted for Lentil cake but not Cheating (in Hindi Dhoka means Cheating) ! This dish is traditionally prepared without using Onion and Garlic. My Maa makes awesome Dhokar Dalna and she never uses a packaged mix which is now easily available in Grocery shops in West Bengal and Bong shops in other states/ countries though I found that packets really useful since making Dhokar Dalna is a bit tedious for me! Dhoka is prepared with a mixture of Cholar Daal and Matar Daal, however, some people use only Cholar Daal or Bengal Gram for preparing Dhoka. My Mom uses both the lentil in a ratio of 3:1 and I also prefer to use both upon the availability of Matar Dal or Yellow Split Pea in my kitchen store…. Potato plays the major role in almost every Bengali “Dalna”. In fact, By the size of Potato the name of the Gravy changes in Bengali Cuisine. While preparing Dalna We need medium cut potatoes which means a big sized Potato divided into eight pieces. A signature Bengali no onion no garlic dish where Dhoka bhaja or Fried lentil cake is cooked with potato and tempered with clarified butter, and Indian spices. Carom Seed (Jowan/ Ajwain): ½ Tsp. Kashmiri Red Chili powder: ½ Tsp. Soak both the pulses for about 2 to 3 hours (preferably overnight) and then make a paste of the soaked pulses (make sure that the paste is medium smooth in texture). Dry Roast Carom Seed and then make a powder of Carom Seed or Jowan. Add Salt, Turmeric Powder, Red Chili Powder, Sugar, Asafoetida, Garam masala powder Cumin Powder and Carom Seed Powder to the paste. Heat 1 Tbsp. of oil in a non-steak pan. Add the paste and cook for 2 to 3 minutes in medium flame to semi-cook the Daal mix or till the moisture evaporates a bit and the mix dry. Cut Dhoka into small diamond shaped or square pieces. Heat sufficient Oil in a Wok and fry Diamond shaped Lentil cakes a.k.a Dhoka in medium flame till those turn Golden Brown in color and strain from Oil. I prefer to fry 2-3 Dhoka in each batch. Fry Potato cubes in the remaining oil until those turn Golden Brown in color. Make a Paste of Turmeric Powder, Kashmiri Red Chili Powder and Cumin Powder with 1 Tbsp. of Water and keep the paste aside. In a Pan heat two Tbsp. Oil and temper it with Cumin Seeds, b, y leaf and Dried Red Chilies and Asafoetida. Add Chopped Tomatoes and Ginger Paste and cook for 2-3 minutes in low flame and add previously prepared Masala Paste and then cook for 4-5minutes unlit oil separates from the mixture. Now add very little water in between if required. Add Salt and Sugar to the mixture. Now add Fried Potatoes and then add two cups of water (hot) and Cover the Pan with a lid and cook for around 5 minutes or till Potatoes soften. Add the fried Dhokas carefully and cook for 5 minutes in low flame. Add Ghee and Garam Masala Powder and then cook for 1-2 more minutes and switch the flame off and give the dish a standing time of 10 minutes before serving. Dhokar Dalna is mostly served with Luchi or Steamed Rice however goes well with Ghee Bhat or Radhaballabhi or Hing Er Kachori (Click on highlighted links for recipe). 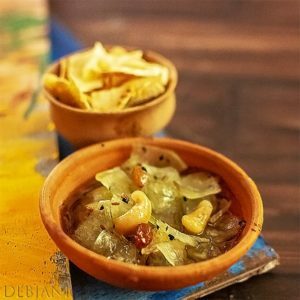 Have you tried the Dhokar Dalna Recipe from Debjanir Rannaghar! This post may contain Affiliate link!